Your CTPS designation must be renewed every three years. Renewal is based on an accumulation of points or by re-application and re-examination. For each three-year period, there is a renewal fee of $150 for members and $250 for nonmembers. Continuing Education Credits must be submitted along with the renewal fee before the expiration date. To retain the CTPS credential, you must accumulate 30 credits of Continuing Education (CE), professional development or other areas such as leadership, instruction, or writing every three years and submit a completed CTPS renewal report form. Points for renewal can be earned starting from the date appearing on the CTPS certificate for the first renewal or from the date of the last renewal, whichever is applicable. Click here to track your CE credits and for Certification renewal (requires an account). Click here to register if you do not have an account. For renewals, after you enter and save your credits, a CAUCUS representative will contact you. Please click here to contact us for information on how to renew your CTPS certification. Attend seminars, conferences or courses in the technology procurement industry. Serve as speaker, instructor, or panel moderator in a forum for technology procurement professionals. Successfully complete accredited college-level courses directly related to technology procurement. Contribute to industry publications as an author. Contribute to industry publications as an editor. 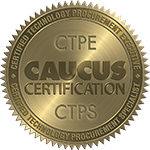 Serve as member of a Caucus committee relevant to technology procurement. Serve as author or principal editor of a book pertaining to the art and science of technology procurement.